The Walter Camp Football Foundation has announced the Football Bowl Subdivision National Offensive and Defensive Players of the Week, presented by Generation UCAN, for games ending October 6. 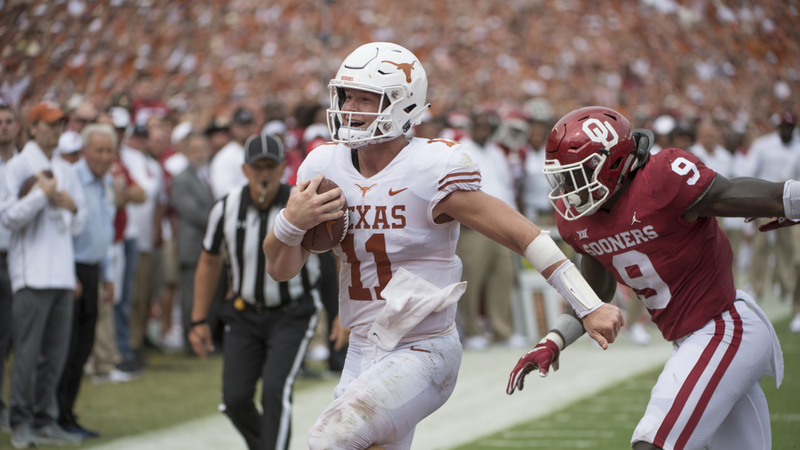 Sam Ehlinger accounted for five touchdowns (2 passing, 3 rushing) as 19th-ranked Texas defeated 7th-ranked Oklahoma, 48-45, in the AT&T Red River Showdown. Ehlinger passed for 314 yards (24-of-35) and two touchdowns, and rushed for 72 yards and three more scores as the Longhorns improved to 5-1, 3-0 in the Big 12. Notes: Sam Erlinger is the eighth Longhorn to receive Walter Camp National Player of the Week honors since 2004, and the first since linebacker Malik Jefferson (Oct. 11, 2015). Vosean Joseph recorded 14 tackles, including 3.5 for losses, and two quarterback sacks as 22nd-ranked Florida defeated #5 LSU, 27-19. With the victory, the Gators improved to 5-1, 4-1 in the SEC. Notes: Vosean Joseph is the eighth Florida player to earn Walter Camp National Player of the Week honors since 2004, and the first since linebacker Antonio Morrison (Oct. 4, 2015).